Southeast Louisiana has an unprecedented opportunity to shape a growing water management (WM) economic cluster focused on the costly restoration and protection of our coast. This cluster holds promise for employing thousands of workers in relatively high-paying jobs requiring low-to-moderate levels of education/training. But WM faces competition from the oil and gas and local construction clusters for these workers. If leaders across industries work together to shape and scale up investments in skills training and education, as well as address transportation, this employment boon stands to benefit both workers and employers across Southeast Louisiana. The deterioration of Louisiana’s coast and the challenge of restoring it has been the focus of significant media attention recently.1 The scale of the restoration challenge is gigantic, with a price tag of $50 billion according to the state’s most recent Coastal Master Plan.2 Even initial steps to execute this plan, while small in comparison to the full effort needed, are nonetheless, enormous. This brief highlights the types of jobs that are and will become available in WM, the industry clusters that are competing for the same workers, and areas where there may be opportunity for collaborative training and education investment. 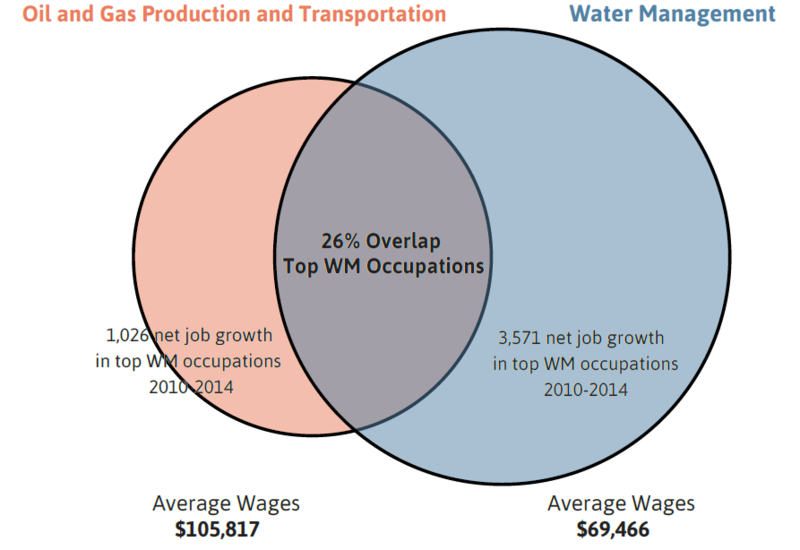 What types of jobs are in the water management industry? The WM cluster is comprised of relatively high-paying jobs that require low-to-moderate levels of training and education. Of the top 20 jobs in WM, half do not require a college education. Seven occupations do not require an apprenticeship. Nevertheless, the other half of the top WM occupations require either a bachelor’s or an associate’s degree, indicating a level of technical specialization within the WM cluster as well as a need for engineering, information technology, financial, and managerial programs to train these important positions. Source: The Data Center analysis of data from EMSI. Notes: The top jobs in WM are defined as the occupations with the largest number of jobs within the WM cluster that also represent at least 20 percent of all WM jobs region wide. This 20 percent cutoff was established to filter out administrative positions that exist across all clusters and that are not characteristic of the WM industry specifically. Fully 15 out of the top 20 WM occupations pay more than the regional median earnings for all Southeast Louisiana jobs at $18.73 per hour. And of those water management jobs that pay more than $18.73 per hour, six do not require a bachelor’s degree. What is the outlook for these occupations? More than 3,500 jobs were added in the top 20 WM occupations between 2010 and 2014 in Southeast Louisiana.10 The largest growth was seen in middle-skill occupations, such as welders, carpenters, and pipefitters. There was also significant growth in jobs for accountants and construction laborers. In many of the top 20 WM occupations, over 15 percent of the workforce is 55 years old or more. New jobs, plus retirements, will yield more than 12,000 job openings11 between 2015 and 2019 in the top 20 WM occupations. 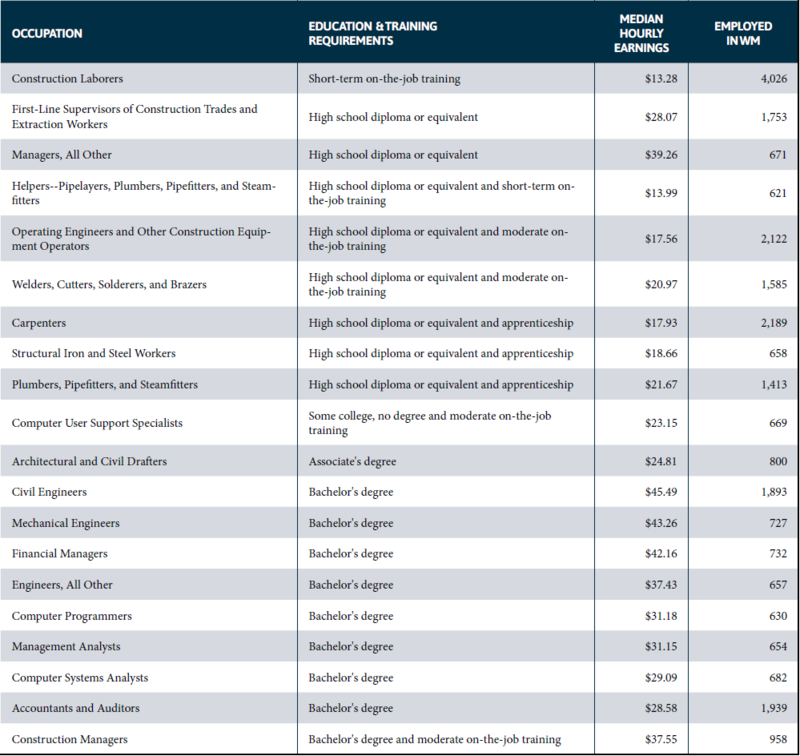 The thousands of projected job openings in the top 20 WM occupations represent an employment boon for Southeast Louisiana. However, because occupations span many industries, WM employers will have to compete with other employers that seek these same skill sets. What industries compete for these workers? 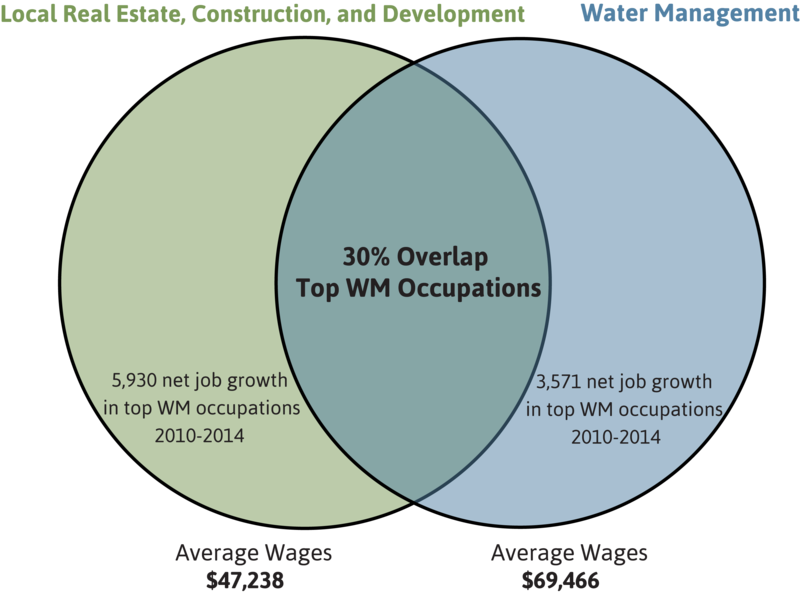 Of the top 20 occupations in WM, the greatest overlap is with two specific industry clusters: local real estate, construction, and development, as well as oil and gas production and transportation. Water management has a distinct wage disadvantage as compared to oil and gas where average annual wages are $105,817. However, jobs in the WM cluster grew at a faster rate from 2010 to 2014. 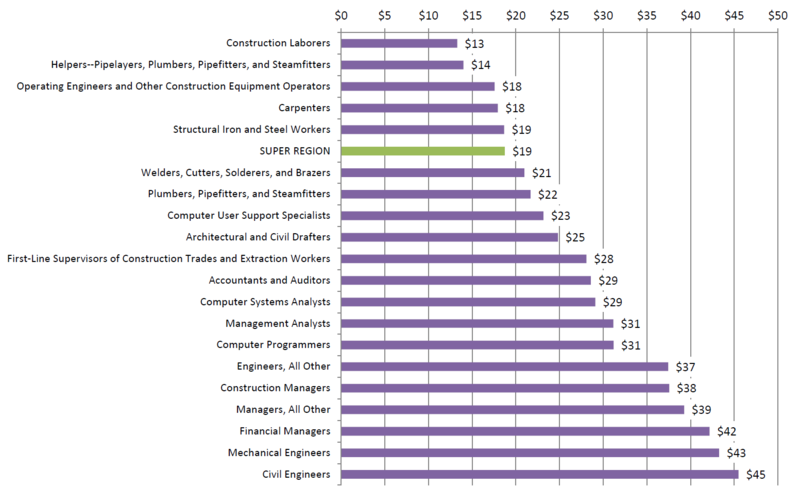 Notes: Average wages refer to all occupations in each industry cluster. Substantial overlap between water management and local real estate/construction is also notable. Despite lower annual wages, the proximity of local construction jobs to population centers may be more appealing to many workers who would otherwise consider work in coastal restoration. The shared occupations between these three industries represents not only possible competition, but also potential for collaboration in skills training and education investment across clusters. With each industry growing jobs, there will be shared challenges to training and scaling up the necessary workforce, as well as transporting workers to job sites away from population centers. Footnotes can be found in the pdf report that is available for download on the top right of the page. 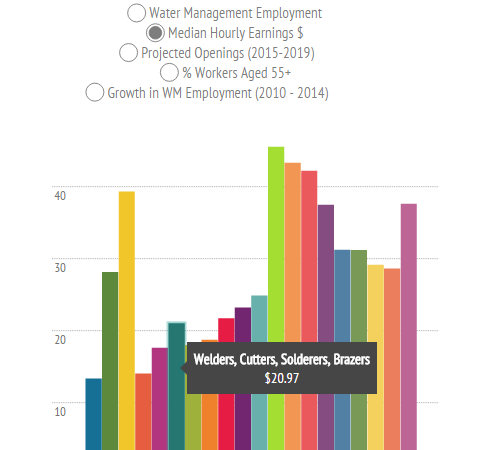 Interactive: What are the top water management occupations? For more on the water management industry cluster, see The Coastal Index: The Problem and Possibility of Our Coast.